I’ll give the second half of Jessica Jones’ second season this: It’s way less slow and boring than first half of the season was. The pace has improved significantly, the plot twists are coming faster, and there’s no doubt the show is a lot more engaging to watch. But is it actually telling a more interesting, coherent story? Not really. And unlike in the first half of the season, where I at least had hope that the series was building towards something better, it’s slowly starting to sink in that this is the season of Jessica Jones we’re getting. And while it’s perhaps not the weakest season of one of these Defenders series (Iron Fist exists, after all), the quality dip between the first season and the second makes this one seem even weaker than it perhaps actually is. On the other hand, Jessica Jones just offered us another hour with David Tennant in one of his most compelling roles so I can’t be too mad at it either! In my binge-review of Jessica Jones’ first season finale, I wrote about my conflicted feelings towards Kilgrave’s death. From a storytelling point of view, it was an incredibly satisfying conclusion to Jessica’s arc. But from the point of view of a person who found Tennant’s Kilgrave to be a compellingly terrifying character to watch, I was sad that were losing him as a presence on the series. And watching Tennant return in a one-off appearance just drives home how much this season of Jessica Jones has struggled to create an antagonist who’s anywhere near as compelling as he is. 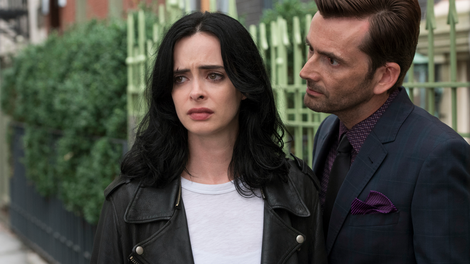 Thankfully, Jessica Jones manages to bring Kilgrave back without undoing his death. One of Jessica’s biggest fears is that she’s secretly a villain, not a hero. And when Dale’s death brings that fear to the surface, Jessica manifests it via the form of the biggest villain she knows. Kilgrave becomes Jessica’s twisted imaginary friend as she tries to figure out whether she’s sunk to his level of villainy. Kilgrave isn’t a physical threat to Jessica (which is a relief), but he does represent a deeper psychological threat for her sense of self. While this season is built around Jessica’s trauma at being forced to kill Kilgrave, it’s largely moved away from exploring the trauma Jessica experienced during her time as Kilgrave’s prisoner. It’s certainly still there in Krysten Ritter’s performance—most obviously in moments like the way she reacted to Dr. Karl after she woke up tied to a bed—but the show mostly just takes all that as a given without delving into it in more detail. This episode, however, finally takes some time to examine the impact Kilgrave had and still has on Jessica. While it’s my job to review the show we got, not try to rewrite it, I can’t help but wonder what this season would’ve been like if Jessica’s Kilgrave visions had been a regular part of the series. Because the visions don’t just feel like a cheap way to get Tennant back in the purple suit for an episode. Instead they seem like a natural way for Jessica’s most recent trauma to manifest. The smartly directed concept provides moments that are both darkly funny (Kilgrave singing “I Want Your Cray Cray”) and deeply disturbing (a naked Kilgrave suddenly appearing in the shower with Jessica). And it also gives Jessica someone to bounce off of as she sets about faking Dale’s suicide and later trying to stop Trish and Dr. Karl from continuing IGH’s experiments. Unfortunately, while the Kilgrave stuff is a huge success, the rest of the episode isn’t. The biggest weakness is Trish and Karl’s descent into superhero-fueled madness. Jessica notes that Trish’s erratic behavior can be explained away by the fact that she’s going through withdrawal, but it’s still hard to buy just how unhinged Trish’s become in these past few episodes. There’s a lot of potential in the idea of Trish desperately trying to become a hero while Jessica desperately tries not to become a villain, but this episode drops the ball when it comes to executing that idea in a compelling way. And though the season’s pacing is currently better than it once was, the slow start is still having negative ripple effects down the line. This season didn’t properly introduce Dr. Karl Malus or his romantic relationship with Alisa until its sixth episode, which makes it harder to invest in the importance of those things in this episode. I like Callum Keith Rennie’s laid back, hippy-ish portrayal of the character, but that’s not enough to make me want to sit through a lengthy seaside flashback to Karl and Alisa’s first kiss. And I also don’t buy the leap Karl makes from happily experimenting on Trish to suddenly blowing up both himself and his life’s research. The emotional climax of “AKA Three Lives and Counting” hinges on the moment Jessica decides not to murder Karl. But Dr. Karl just hasn’t been enough of a presence on this series to make that moment land. As with the previous episode, I can intellectually understand Jessica’s anger, but the show hasn’t made me feel Jessica’s hatred of Karl on a visceral level. But despite all of those many, many big picture concerns, there’s no doubt that “AKA Three Lives And Counting” works really well as a character study of Jessica. She faces her worst fear and learns she has far more inner strength than she thought she did. Kilgrave will always be a part of her story, but he doesn’t define who she is. “I’m more powerful than you ever were,” she tells her vision of Kilgrave before banishing him from her presence. And while I’m happy for Jessica’s emotional breakthrough, I’m once again sad to see Kilgrave go. Is Alisa’s unkempt hair an active styling choice on her part? Or are we supposed to think that’s just the only wig she has access to? Jessica tracking Malcolm’s location via a dating app was one of the cleverer investigative things this show has done, although I don’t think dating apps usually give out phone numbers like that. I have two other Netflix recommendations based on this episode: If you liked the way Tennant appeared as a vision only Jessica could see, I highly recommend the cool, humanistic sci-fi series Sense8. (It’s weird but stick with it through the fourth episode to get a sense of everything it’s trying to achieve.) And if you’re a fan of Tennant in general, I highly recommend Broadchurch, especially it’s very strong first and third seasons.